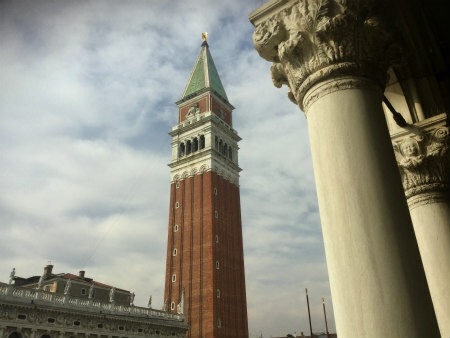 Venice Campanile from Palazzo Ducale - Photo: Cat Bauer (Venice, Italy) Happy Birthday to Francesco Morosini! 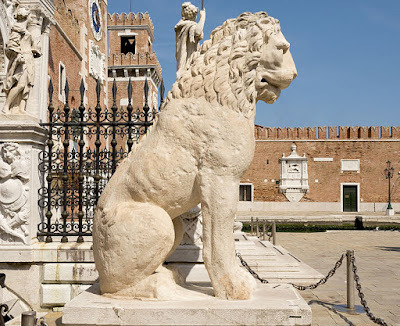 One of Venice's greatest heroes is 400 years old today, and many of the most important institutions in town will be celebrating throughout the year. Morosini is known for his military campaigns in Greece against the Turks, especially for his victories in the Peloponnese peninsula, and was called Il Peloponnesiaco. 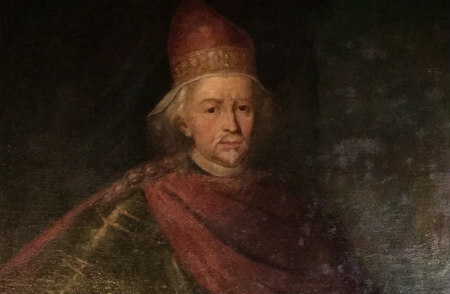 He was the Doge of Venice from 1688 until he died on January 16, 1694. Today at Palazzo Ducale the celebratory program was announced to a room full of illustrious folks. Portrait of Francesco Morosini by Bartomeo Nazari (detail) - Photo: Cat Bauer Francesco Morosini was born on February 26, 1619 into a noble Venetian family, full of prestigious ancestors, including Giovanni Morosini, who founded the Benedictine Monastery on the island of San Giorgio Maggiore in 982, as well as doges and dogaressas. 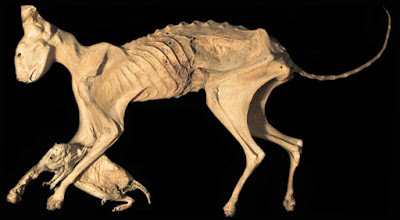 Doge Francesco Morosini's Cat - Google Art & Culture Athens had been under the control of the Ottoman Turks since 1458. As time went on, they began storing gunpowder in the Parthenon and the Propylaea on top of the Acropolis. In 1640, a lightning bolt struck the Propylaea and destroyed it, which should have been a warning that storing gunpowder in sacred structures displeases the gods. On September 26, 1687, when Francesco Morosini and his troops besieged the Acropolis during the Morean War, what Morosini described as a "fortunate shot" hit a powder keg and caused the Parthenon to explode. Piraeus Lion at Arsenale - Photo: Didier Descouens Morosini is also famous for looting the ancient (c. 360 BC) Piraeus Lion from the harbor of Athens, which you can see today in front of the Arsenale here in Venice. Andrea Bellieni, Bruno Buratti, Luigi Brugnaro, Luca Zaia, Emanuela Carpani, Andrea Romani, Giuseppe Gullino Photo: Cat Bauer Many high officials were at the official presentation of the program at Palazzo Ducale today, including President Luca Zaia, Governor of the Veneto Region; General Bruno Buratti, Commander of the Triveneto Guardia di Finanza; Rear Admiral Andrea Romani, Commander of the Istituto di Studi Militari Marittimi e del Presidio Marina Militare di Venezia; and Sindaco Luigi Brugnaro, Mayor of Venice, along with many others. 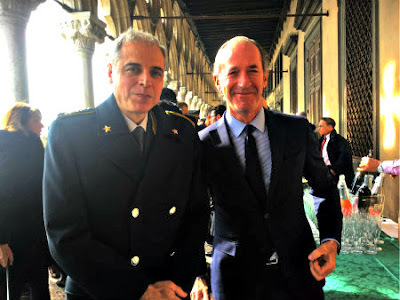 General Bruno Buratti & President Luca Zaia - Photo: Cat Bauer One of the most interesting events sounds like it will be an exhibition at Palazzo Corner Mocenigo, Headquarters of the Veneto Regional Command of the Guardia di Finanza in Campo San Polo. Francesco Morosini in the Wars of Candia and the Morea opens to the public from June to October, when paintings, maps, historical documents and more will be on show. General Bruno Buratti is the coordinator of the organizing committee, and he gave an amusing and fascinating rundown about Morosini (and his cat) and all the projects at today's ceremony. 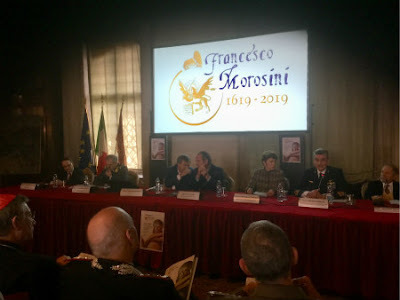 If you go to the Francesco Morosini 1619 - 2019 site there is a category called "Eventi," which tells you (in Italian) the entire program broken down by categories.